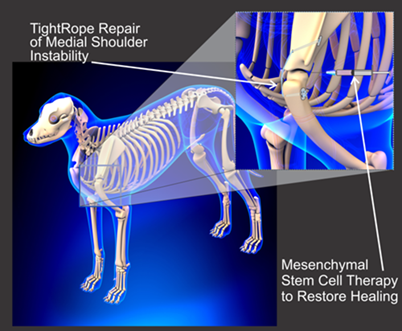 Medial Shoulder Instability (MSI) occurs when the shoulder joint becomes unstable and unable to hold the weight of the dog. Therefore, MSI is due to injury of the supporting tissues of the shoulder joint; which includes the medial glenohumeral ligament, the tendon of the subscapularis muscle, the fibrocartilaginous labrum and the tendon of the biceps brachii. Tears in the medial (inside) joint capsule are often present on arthroscopy. Symptoms include an obvious lameness that may come and go, shortened stride and muscle atrophy from lack of use. 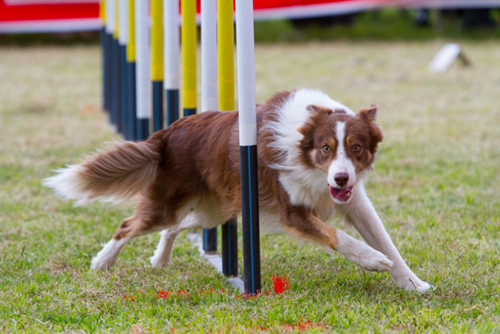 This condition is a leading cause of shoulder pain in dogs; particularly athletic, field trial or agility (medium to large breed) dogs. However, it is more common in younger male dogs that are less than 5 years of age and dogs with hip dysplasia. Severe cases may need surgical stabilization with artificial prosthetic ligaments, however, most cases can be managed with regenerative therapies and rehabilitation. Recent cases of MSI have been successfully managed with a combination of regenerative therapies, such as stem cell injections and Platelet Rich Plasma (PRP). At Safari, we recommend this therapy along with physical therapy for rehabilitation. Rehabilitation is usually started about 3 weeks post injection of stem cells. Therapeutic exercises that cause activation of the extrinsic and intrinsic muscles of the shoulder and core body muscles are utilized. Different surfaces are used for balance and exercise, such as wobble board activity. More advanced rehab includes Cavaletti training and weave poles in slow motion. Underwater treadmill training is used for strength training and to prevent muscle atrophy. Note worthy: DogLeggs has developed a Shoulder Stabilization System (harness), as well as a Dog Shoulder Vest. A veterinary prescription is required to order these products.